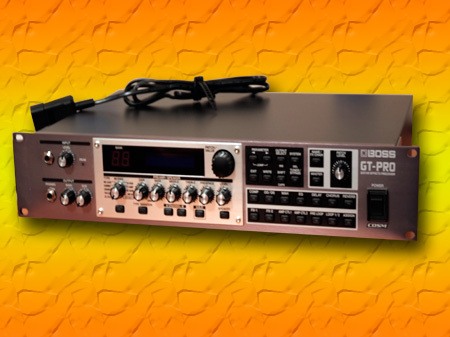 The GT-Pro: Hailed by Roland and Boss to be the best thing in effects units since sliced bread. But exactly how good was this 'top of the line' Roland product exactly? Was it really the mutts nuts? It was originally in my rack, then it got moved to the studio rack.. then I sold it. It remained like new - simply because I could not get along with this unit - like the GT-8 I had, I really did not use it much.... You know the specs... but I would NOT buy another - basically overpriced for the rack version. Boss used to howl about it... I howled at it... I'm not going to go in to depth with this one. Lets just say that the GT-8 and this (mutton dressed as lamb) was not my cup of tea. You might like it.. but given that technology has moved on so far (checkout the VG-99) I would sell it... which I did. I sold this one??? The money was better than the GT-Pro. I stand by this review - for more of the same but worse checkout my GT-8 Review... and you thought it could not get worse? DON'T BUY ONE OF THESE. The product was in fact so bad that I never did even complete the review of it here... totally frustrating product with little or no support. I did 'peek' under the bonnet but sadly there is also little to report there it's completely unspectacular. Just don't buy it!